Lymph node. Three-dimensional CT (computed tomography) scan of the left lymph node (red) in a human neck. This kidney-shaped structure forms part of the lymphatic system in the body and has an important role in immune defence. The node synthesises and stores both the B and T- lymphocytes (white blood cells) responsible for detecting and destroying invading pathogens. The node also filters circulating lymph fluid. 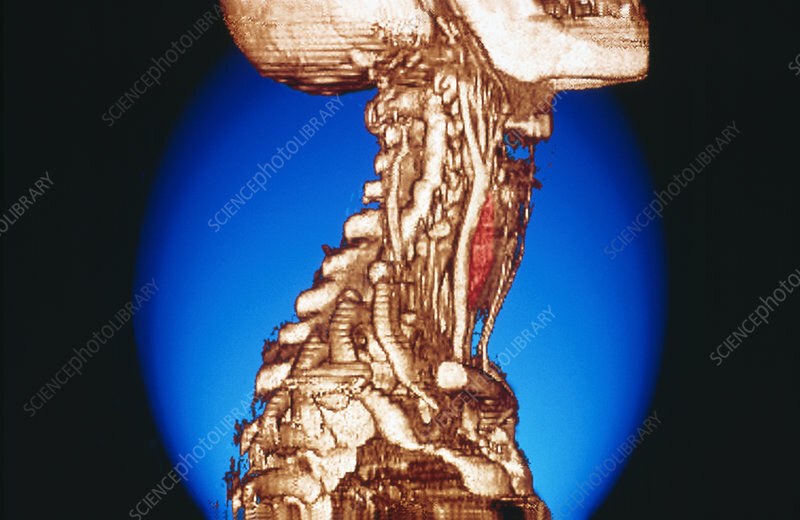 The image was produced by combining several CT images of "slices" through the neck region, generated by a combination of X-rays and a computer.